We had a fantastic time in Washington. It’s one state that is hard to get tired of. We can’t wait to come back and explore more, but for now…we head east! With Coeur d’Alene punched in our GPS, we contacted friends, Take That Exit, who used to travel full time but now have a sweet home in northern Idaho. Turns out that they were camping for the weekend up in Priest Lake and said we could join them. The kids were so excited to meet up with their kids again. It had been almost 2 years since we last saw them. We made it to Luby Bay Campground and fell in love with the area. The lake was beautiful, but it was so nice to visit with our friends again. We were only there one night, but the kids got to swim and play on floats and get worn out with their old friends. We said our goodbyes in the morning and headed north. We were in need of some good boondocking. 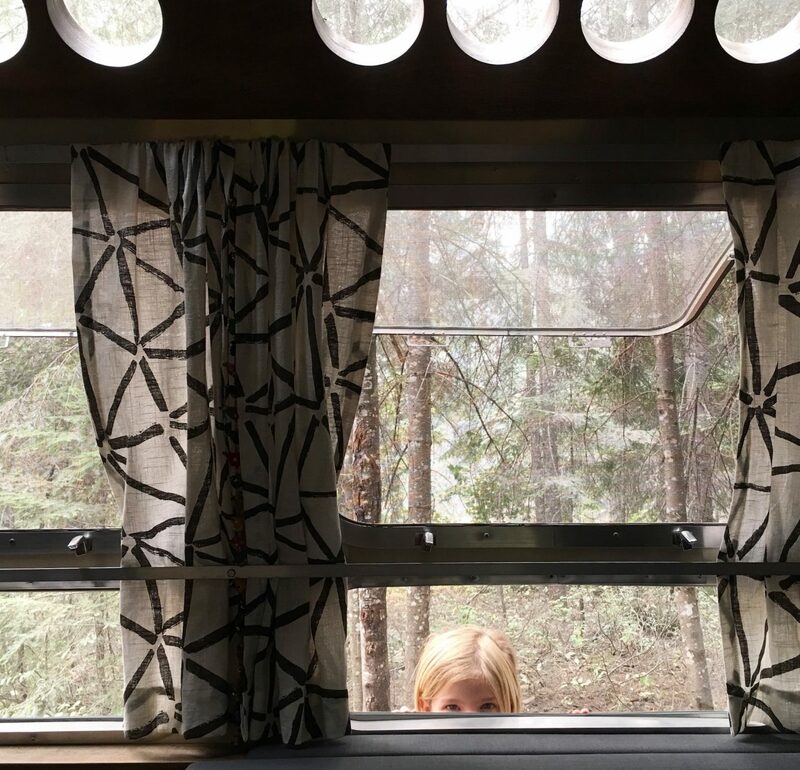 We knew of a sweet boondocking site around Bonners Ferry, ID that some friends told us about. It was so nice to be back in the woods and alone! We love to visit with friends, but there’s just something so special and wonderful about being alone in the woods with the ones you love. No one else around, just you and nature. It’s magical and if you haven’t given boondocking a try, I highly suggest you do. We ended up in a different spot than we originally planned, but I think our spot was a little better anyway. There was a creek in our front yard and the view at sunset was incredible from down there. We took it easy in this perfect little spot. Not a care in the world. Lots of resting, relaxing, and enjoying being together. Since the creek in our 'front yard' was not very deep, we drove down the road to another spot where the water was deeper. The first time I took them, they didn’t want to get in. It was SO COLD. There’s no way I’m getting in there, which really sucked because I was counting on this being our baths for everyone. The kids braved the cold waters (well, the younger 3 did) and Adali and I watched them shivering and having the time of their lives. I think this may have been their first time swimming in a creek. The next day the were begging to go back and swim. I couldn’t say no to another ‘bath day’ so yes! Let’s go swimming!! They had so much fun and I may or may not have told them what skinny-dipping was and they may or may not have had the best day of their lives. Next day was just the same. They had to go back to swim. This time I told Jonathan he should come with us so he can get in with them. He braved the freezing water and had a great time playing with them. Jax warned him that, 'At first it burns because it’s so cold, but then you get used to it once you can’t feel your legs anymore.' Ha! One night while Jonathan and I were Netflix and Chilling (ok we were really just Netflixing), we heard what we thought was a raccoon on our roof. It was really loud and sounded heavy. We got up to see what was out there which probably wasn’t the greatest idea since we’re in bear country. At one point it sounded like something was trying to come inside the vents on our roof. What the heck is it? We grab a flash light and quickly open the door and there it was! A little tiny mouse just staring at us, standing on a bag of chips! Jonathan quickly shuts the door and I freak out. What do we do? We don’t have traps. Is there just one? We grab a couple bowls in hopes of trapping it when we open the door back up. That will work…right?? Jonathan opens the door and we’re ready to trap it but…it’s not there! WHAT? NO! We pull everything out of the pantry in hopes of finding it but we don’t. We lay back down and listen. Shortly after, we hear the noises again. We swing the pantry door open again and…no mouse. What the heck? I knew I heard it. I gently slide open the trash bin drawer and, there it is!! Just sitting in our trash can eating whatever it can find. I slam the door back and get our bowls ready. Open it again...and it’s gone! Clearly we don’t know how to hunt mice. Those things are fast! Long story short, we ended up getting traps the next morning and that night, we caught two! The next night we caught one. Then we had one night of hearing one but it never got on the traps…until the next night. We ended up catching 4 mice in 3 days! Shew. I’m so glad that’s over. We obviously have been in the area too long if tiny creepy friends are coming inside. After getting a little stir crazy, we decided to make the long drive to go check out Kootenai National Wildlife Refuge. We are blown away every new place we visit in Idaho. It's easy to see why so many of our friends are buying property in this great state. Again, the pictures just can't capture the beauty there. If you find your self in the northern part of Idaho, make sure you visit this place. Incredible! Go towards sunset for an even more magical experience. A couple days later we woke up, looked outside and we were so confused. They sky was red and it looked like a sunset. We knew there had to be fires in the area so a quick search proved that there was indeed a lot of fires all around us. Eastern Washington, Western Montana, and north of us in Canada were all ablaze with wildfires. No wonder. We knew we’d be heading out in just a couple days so we just decided to hang tight in our spot until it was time to head to Canada. The smoke continued to get worse and Jax and Ada started to feel really sick to their stomachs. It’s time to get out of here. We pulled out and headed north to Canada! We’ve been planning this trip for weeks and we were so excited to finally get to 'live in Canada' for a bit. It’ll be a blast, eh?